http://www.JewishWorldReview.com | America's war on terror was launched when the heroes of United Flight 93 rushed the hijackers over Shanksville, Pa., aborting what would have been al-Qaeda's fourth 9/11 attack. In the decade that began on that terrible day, the goal of disrupting and crushing the Islamist terror network has been pursued with remarkable versatility: The United States has fought this conflict with military, diplomatic, and financial weapons; it has relied on aggressive intelligence-gathering and sensitive counterinsurgency; it has reshaped airline security and rewritten civil-liberties law. Jihadists have been killed with Predator drones abroad, detained as enemy combatants at Guantanamo, and thwarted in undercover stings at home. Yet in the long run it may turn out that more significant than any of these was the war of ideas that followed 9/11. Almost from the outset, President George W. Bush recognized that the United States was engaged in an ideological struggle. During the Cold War two decades earlier, Ronald Reagan had argued that the promotion of freedom should be a key priority in American foreign policy. By advancing the ideals of liberty and human dignity, Reagan told the British Parliament in 1982, America and its allies would undermine the Soviet Union and eventually relegate Communist totalitarianism to "the ash-heap of history." In much the same way, Bush saw, radical Islam could be weakened by deploying the moral force of liberal democracy and equality. Just nine days after 9/11, addressing a joint session of Congress, Bush began to lay out an ideological strategy for defeating the jihadist threat. "Al Qaeda is to terror what the mafia is to crime, but its goal is not making money," Bush said. "Its goal is remaking the world -- and imposing its radical beliefs on people everywhere." Terrorism was not caused by the religion of Islam but by the Islamists' political fanaticism. "They are the heirs of all the murderous ideologies of the 20th century. By sacrificing human life to serve their radical visions -- by abandoning every value except the will to power -- they follow in the path of fascism and Nazism and totalitarianism." The war on terror, Bush accurately foretold, would be a long struggle fought on many fronts. 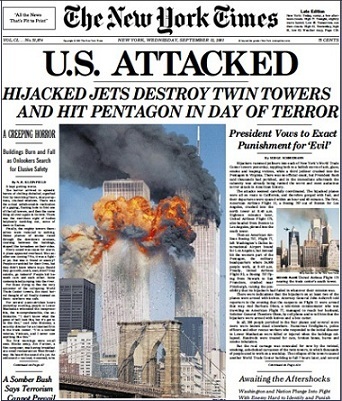 But ultimately the only way to prevent al-Qaeda and its allies from imposing an "age of terror" was for America to sustain an "age of liberty, here and across the world." While Bush would get plenty of things wrong after 9/11, this ideological insight -- that the root of Islamist terrorism was the lack of freedom in the Middle East -- was one of the big things he got right. There were plenty who didn't. Many voices insisted that terrorism was fueled by poverty or lack of education. Other analysts rushed to explain 9/11 as the fruit of US "arrogance," or as a reaction to Israeli-Palestinian conflict. In reality, as Princeton economist Alan Krueger demonstrated in a 2007 book, What Makes A Terrorist?, the best predictors of terrorism are "the suppression of civil liberties and political rights, including freedom of the press, the freedom to assemble, and democratic rights." Bush's campaign to democratize the Middle East -- what came to be known as the "freedom agenda" -- was rooted in the conviction that the way to break the back of jihadist hatred was to drain the swamps in which it breeds: the dictatorships and theocracies of the Muslim Middle East. "Terrorists thrive on the support of tyrants and the resentments of oppressed peoples," he said in 2003. "When tyrants fall, and resentment gives way to hope, men and women in every culture reject the ideologies of terror, and turn to the pursuits of peace." For decades, foreign-policy "realists" argued that stability in the Arab world was more important than liberty, and so it was better to tolerate oppressive regimes than to risk the upheaval that democratic change might bring. That was the roadmap that led to 9/11. Today, 10 years after 9/11, the region is more unstable than it has been in generations. Iraq's dictator is dead, Libya's is on the run, and demands for freedom and democratic reform have shaken regimes from Tunisia to Syria to Iran. Yet who wouldn't prefer today's churn and ferment to the illusory stability of 2001? No, Islamist terror hasn't been eradicated. Liberal Muslim democracy has a long way to go. But we have engaged the struggle of ideas. And as we fight not just the terrorists, but the poisoned ideas that motivate them, we are slowly winning the war that began on 9/11.